Don’t waste beer at line cleaning … SELL IT! It has been established that the friction of beer flowing through a plastic beerline results in a static charge building up on the inside of the line. In the same way, if you rub a balloon on your jumper, the friction will cause a positive charge to build up on the balloon which will then pick up fragments of paper. Similarly, in beerlines, the friction caused by the beer flow results in a positive static charge building up on the inside of the line. Beer contains, among other materials, protein molecules which have faintly positive and negative charged ends. The negatively charged ends of the protein molecules will therefore stick to the sides of the line in much the same fashion as the fragments of paper stick to the balloon. Bacteria and yeasts etc., which are also present in beer, attach themselves to the proteins, and basically feed on them. This ‘biofilm’ produces unpleasant taints in the beer and other by-products which themselves result in ‘fobbing’ at the font, necessitating (as well-known by publicans!) an immediate line clean. 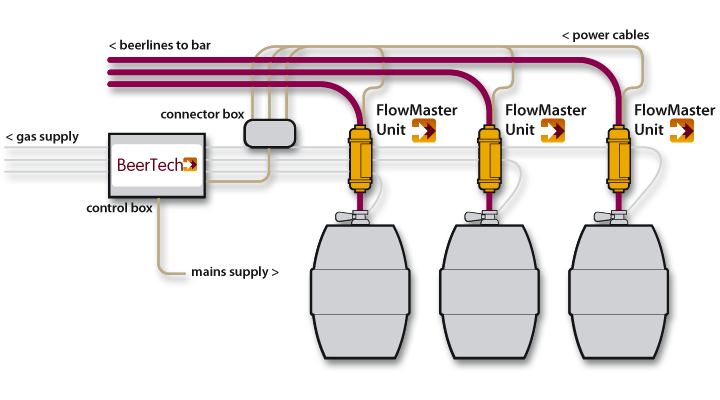 With the FlowMaster system,a small unit is slid over each “working beerline” in the cellar. There is an alternating magnetic field created within this unit that the beer passes through as it leaves the barrel. This causes the protein molecules to go into a spinning motion, which inhibits their ability to stick to the positively charged side of the line. The deposits of proteins then take three weeks or more to build up to the point where the line requires cleaning, saving at least two thirds of the beer normally lost over the course of a year. Furthermore there will be a substantial reduction in unpleasant taints and ‘fobbing. No matter how well beerlines are cleaned, there will be a small amount of residue left over on one side of the line. This is known as Biofilm. It is a combination of the proteins and bacteria that, when not removed fully, will develop a protective film and will act as an additional key for the start of the deposit build up. However when the FlowMaster system is in operation, the protein molecules that normally feed the biofilm will simply flow up the beerline. Over a period of time therefore, the biofilm will be weakened, broken up and removed, improving the internal surfaces of the lines, and by default the quality of the beer!